The most complete Trine ever created! Trine returns in 2.5D! The three heroes of the best-selling adventure series are back, sent on a quest to retrieve the troubled young Prince Selius. Amadeus the Wizard, Pontius the Knight, and Zoya the Thief are joined together once again on a thrilling quest through fantastical fairytale landscapes teeming with danger. Prince Selius suffers from intensely dark dreams and due to his magical talents, monstrous nightmares are able to slip into reality and wreak havoc on the waking world. Amadeus, Pontius, and Zoya must find the afflicted prince and resolve the desperate situation before the world is engulfed by the Nightmare Prince’s shadows. Trine 4 reaches new heights in the series, bringing the most complete gameplay experience ever to fans and new players alike! The upcoming Trine 4: The Nightmare Prince PC, PS4, Switch and Xbox One release date is Q4 2019 in the US and the UK. 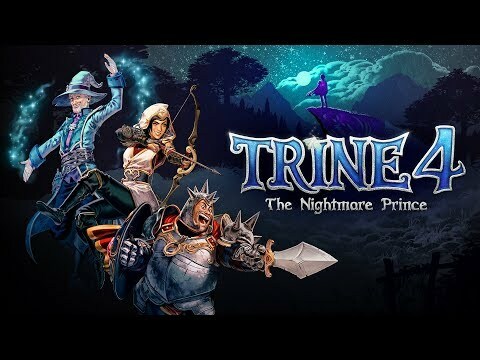 Notify me when Trine 4: The Nightmare Prince is available.